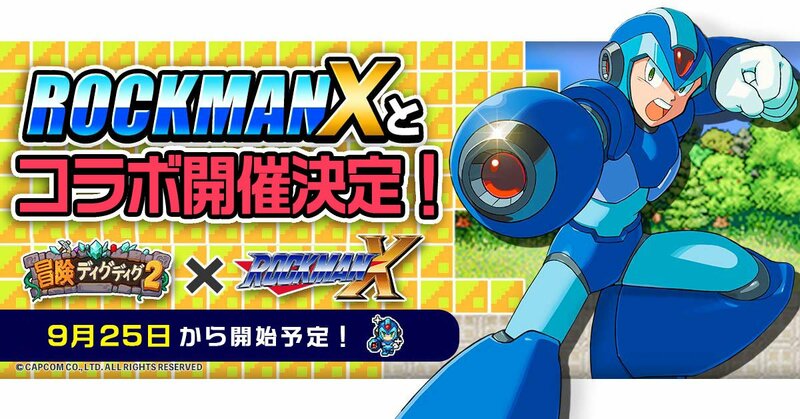 Rockman X is headed to mobile JRPG Adventure Dig Dig 2, according to the developer's official Twitter. X series-related content will begin appearing in the game on September 25th. A small sprite of X in can bee seen in the above promo, which seems to suggest our favorite Hunter – and maybe some other characters – can be added to player's parties. Adventure Dig Dig 2 is only playable in Japanese so unless you're fluent, this news has no bearing to you. I do, however, want to point out this is yet another example of a "new" X series "thing." We've been seeing a lot of X series love lately – more so than usual. A sign of bigger and better things to come maybe? X's 25th anniversary is next year... who knows! X's 25th anniversary is next year, but the fact that he is used so often, over classic at that, makes me hopeful! After seeing this, the bajillion new X toy collectibles, and the leaked final boss of MVCI, I can't help but wonder if they're really working on a new X game or not. Do you have this blog on facebook? X's series should have a crossover with something that's both crazy (as in crazy good) as well as brilliant in execution. I just wanna say, I've been calling at the fact that we're getting so much X stuff as hints towards a new game for a LOOONG time now. MvC:I - this was only the tip of the iceberg.. Capcom rep even states during a videotaped interview, "we are selecting and promoting these characters *very specifically*. And X, Mega Man X, is going to have a main role in this cinematic story mode, along with Captain Marvel". We already know why Captain Marvel is being promoted. She has a big movie coming up. But, the signs were already there. Remember, X8? They interviewed the jock group who did the main theme, Wild Fang, about how they felt that one of their songs were being used for a new Mega Man game. They mentioned how they remembered playing Classic growing up. They knew nothing about X, even though their song was for an X game. The Legends 3 demo video that was unearthed a while back, the two Japanese guys who were interviewed to play it, again, confused anything Rockman with the classic series. Legends, X, aside EXE, most subseries of MM are forgotten on Japan, they hear Rockman, they are automatically thinking classic. At least, mainstream Japan is. Japan got that novel. It's basically a retelling of X1 in novel form. The giga series is coming back?! They are still a Japanese company. They are practically re-educating the homeland about X. They don't need to worry about that with us out here in the west. We know who X is. In fact he's probably the most popular version here, or very close in second or third. Either way. I would not be surprised in the least if we get some announcement during TGS, or sonething. They are definitely hinting at something. That's pretty enlightening. I had no idea X was so unknown along with the rest of the subseries. Then again, Mega Man has always been the most successful statesidr, hasn't it? I guess that makes sense.